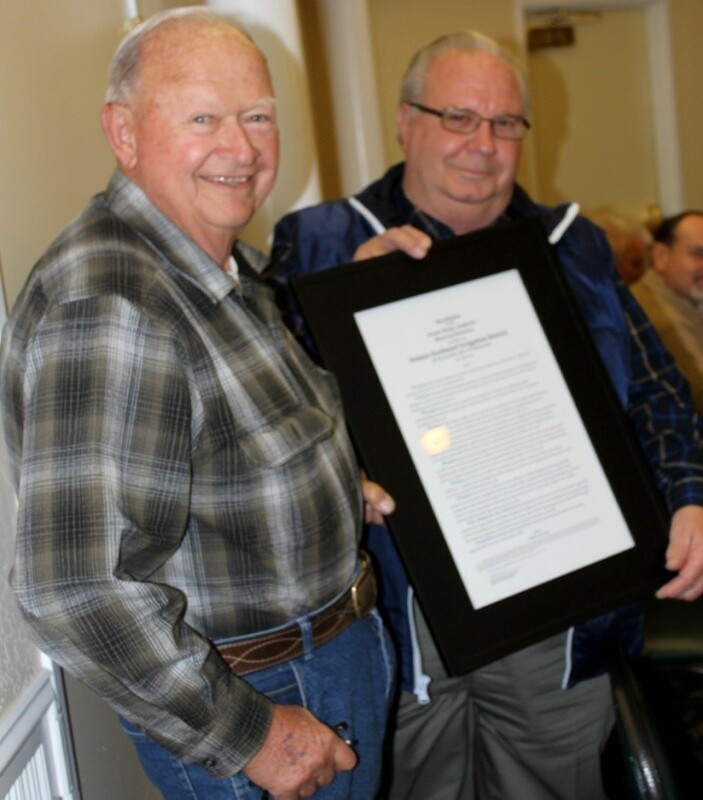 A framed resolution honoring the Delano-Earlimart Irrigation District is presented by FWA Chairman Harvey Bailey (left) to Nick Canata, DEID board member. Seventy-five years of service in providing water supplies for agriculture has been celebrated by the Delano-Earlimart Irrigation District. Marking the milestone, the closely-knit agricultural community in southern Tulare County and northern Kern County came together for a commemorative November 19 Delano luncheon. Those attending received copies of a newly-published DEID history book, Delano-Earlimart Irrigation District: Celebrating 75 Years, which was researched and written by Shelley Orth, the district’s communications consultant. DEID was organized in 1938 to protect the area’s underground water resources at a time in which once plentiful groundwater supplies were diminishing rapidly. The young district sought to secure a long-term surface water contract with the U.S. Bureau of Reclamation for water from the new Central Valley Project’s Friant Division, upon which development was then beginning. In 1945, negotiations began between DEID and the USBR, leading to contract enactment in 1950. “If it weren’t for our contract and the construction of the Friant-Kern Canal, these families wouldn’t be here today,” said Harold Nelson, DEID board President. “The situation out here was dire in the 1930s because of a lack of water. Thankfully, our founders had the foresight to protect our groundwater resources and secured the surface water contract.” Nelson is the son of H.K. Nelson, who led the effort to secure a contract for DEID. H.K. Nelson served on the DEID board for 51 years, and was President for 41 years. The original Reclamation contract included construction of a distribution system. Landowners initially took water from a temporary system. Full contract supplies began to be delivered when the new system was completed in 1956. Friant Water Authority directors, in a congratulatory resolution approved unanimously at a December 13 meeting, declared that DEID “with development and operation of its original distribution system and its more recent state-of-the-art distribution system along with creation of other local and regional water resource development projects has successfully pursued its mission of providing irrigation water to the more than 400 growers it serves within the district’s 56,500 acres. DEID has the Friant Division’s largest Class 1 contract at 108,800 acre-feet of water as well as a Class 2 contract for 74,500 acre-feet. CVP water makes possible production of more than $360 million in crop value, primarily from permanent crops, such as grapes, almonds and pistachios. • Cropping patterns with permanent plantings that have led to the use of highly efficient irrigation systems. • Commitment to groundwater that has led to the purchase and development of groundwater recharge sites and basins. • Partnerships with other agencies for groundwater banking and surface water exchanges. • Distribution system improvements that have resulted in a farmer-friendly system with much greater accuracy and efficiency.